1. Heat butter in a frying pan, add phool makhana and fry them for few minutes. Transfer it to a plate. Set aside. 2. Heat oil in a pan, add cloves, cinnamon, peppercorns, cashews and green chilies one by one and fry them. Add mint leaves and ginger garlic, fry them till slightly brown. Add onion and fry them till transparent. Add poppy seeds and tamarind. Add red chili powder, coriander powder, turmeric powder and cumin powder. Mix well. Finally add coconut and coriander leaves mix well and fry them for few minutes in low heat. Switch off the stove. Let it cool down. 4. Heat oil in a pan, add green peas and little salt. Cover the lid and let it cook. (if you use dried peas, then pressure cook with salt till 4-5 whistle). Add fried phool makhana (step 1) and ½ cup water mix well. Cook for 2-3 minutes. Add tomatoes and cook. 5. Now add ground paste (masala), salt and water. Mix well and cook for another 2-3 minutes. Switch off the stove. 6. 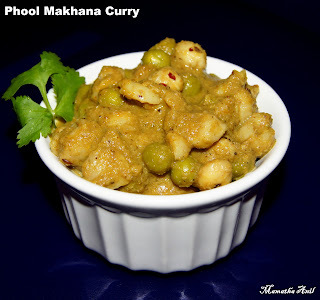 Phool makhana curry is ready to serve. It goes well with roti, chapati, dosa, idli and rice.